Rebbetzin Chana Henkin, Rabbi Eitam's mother, describes what happened the day of her son's murder - and what lies ahead. 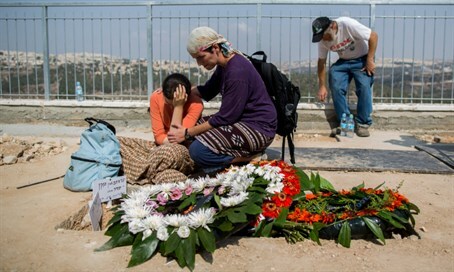 Rebbetzin Chana Henkin, mother of Rabbi Eitam, who was murdered along with his wife Naama in a shooting attack last Thursday in front of their four children, revealed more details of the day of the attack in an Israeli media interview on Tuesday morning. "I remember we ate and laughed and really enjoyed ourselves," Rebbetzin Henkin stated, recounting the family's last day together, in an interview with Yediot Aharonot. "Naama and Eitam cooked and baked. They prepared hot dogs and chicken breast and baked a cake for dessert. We did what every family does on Chol Hamoed." The family left at about 4:00 pm that day. ''We went to Jerusalem, and Eitam, Naama and the four children - Matan (9), Nitzan (7), Neta (4), and Itamar (9 mo.) went to meet friends in Elon Moreh," she said. The family was going to meet friends in the community, with whom Rabbi Eitam had kept in touch since his high school years. Four hours later, as the family began to return to their hometown of Neria, a Hamas terror cell cornered their vehicle and murdered Rabbi Eitam and Naama, with the four children inside. Rebbetzin Henkin couldn't reach her son, and called Rabbi Eitam's brother Yagil in a panic, he revealed. "I realized that something may have happened, and then I got the phone message that said 'be strong, we are here with you," he said. "That's when I realized the worst had happened." Since then, the Rebbetzin said, the children have not left the side of their two grandmothers - herself, and Hila Armoni, Naama's mother. "You have to understand: they were there. They experienced this," she said. "Some of them were asleep in the car [at the time], but some of them were awake and saw everything." Indeed, Matan, the eldest, was awake during the murder, a witness who arrived at the scene shortly after the attack revealed to Israeli media last week. "It is impossible to digest what they went through," Rebbetzin Henkin continued, adding that the effects "will begin to show in the years to come." "This is not living without Mommy and Daddy for one day or a week; these kids won't be able to see their parents again for their entire lives." "We all understand that these children need serious and dedicated therapy," she emphasized. "They have become the children of all of us, the children of Israel." "We are holding family meetings about their upbringing and are trying to find the best way to keep them and raise them like Eitam and Naama would have." "Little Itamar will not remember the many months his parents rocked him to calm him down," she concluded sadly. "Neta, Nitzan, and Matan may remember a little." "I want to emphasize that while we have suffered a great family loss, all of Israel, too, lost very significant people. We do not demand revenge but that leadership moves to provide security for residents."